Can a Wet Suit be Altered or Repaired? Terrapin can repair tears, cuts, broken zippers, etc… to extend the life of your wetsuit. Repairs are priced based on labor and materials, but most cuts, tears, and open seams can be repaired at our minimum half-hour rate of $27. Examples of the cost to do more extensive alterations are shown at the bottom of this page. So don’t throw that suit away, call us first to see if it can be repaired at a fraction of the cost of a new suit. 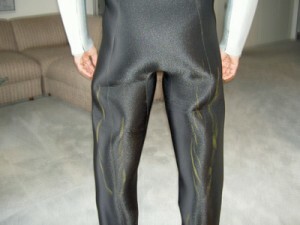 We can alter your neoprene wet suit, microprene, Lavcore or Polartec suit. Generally, making a suit smaller is less expensive than making it larger, because we don’t have to add more material. If you’re considering a new off-the-rack suit and you’re between sizes, select the suit that has the best fit through the torso length … it can be taken in or let out in width, but it requires a lot more time (and $) to remove the zipper to change the torso length. If your suit needs to be made larger, complete both pages of the Measure Chart. Indicate on the drawings on page 2 all the spots that need altering. If your suit needs to be made smaller, marking the excess while you’re wearing the suit will give us much more accurate information for altering. 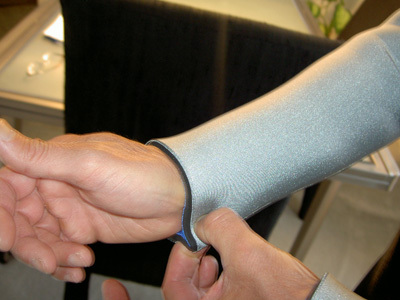 The same marking techniques are used for custom suit fittings or for off-the-rack suit alterations (see below). Don’t forget to sign your authorization on page 1 of the Measure Chart and ship it along with your suit. You’ll need a friend to help with this …there’s just no way to mark it yourself. If you’re starting with a pre-manufactured suit, we’ll try to make all alterations along pre-existing seams. If you’re starting with a Terrapin custom suit, the suit was been glued together, but most of the seams are not yet sewn, so please be gentle getting it off and off. Put the suit on over your bathing suit or dive-skin. If there are zippers on the arms and legs, leave them open for now. Close the torso zipper(s) and identify where the suit may be too loose. If it’s loose through the torso, look at the armpits and decide if the majority of the looseness is in front of the arm or behind it.Steps (2) through (12) are for the friend to do. When the markings and photos are finished, pack it all up and call (830-226-5194) or email to let us know the suit is coming. Ship it to Chris Summers, Terrapin Wetsuits, 6515 State Hwy 27, Center Point, TX 78010-1513. Fold the suit carefully, to avoid causing any unnecessary creasing. Based on whether most of the looseness is in the front or back, go to that side of the wetsuit. Gather up the excess material by pinching the vertical seams on that side of the torso. Pinch both of the seams (left and right side, using left and right hand, respectively), distributing the excess material evenly between left and right. You should be able to pull the wetsuit away from the body by only about one-half inch. Any more than that should be marked for removal. Keep the grip on the excess wetsuit material with one hand and let the other side go. Use the free hand to take up the yellow crayon to mark a 1 inch long vertical line right next to both the outside of the thumb and forefinger holding the excess wetsuit material. Repeat steps (2 and 3) moving up the seam until there is no excess material. Continue to repeat steps (2 and 3) moving down the seam until there is no excess material. Once you have marked along one of the vertical seams, do the same for the other seam on the same side of the body (back left and back right, for example). When you are done, you should see two pair of dotted lines that surround the two seams on the same side of the suit. The pair should be roughly the same width on either side of the seam, and the width of the space between one pair should be roughly the same as the space between the other pair of dotted lines. Now look at the other side of the wearer. Standing or kneeling on one side of him/her, (for example the wearer’s left side) pinch together the excess material you marked on the seam you can reach from that side (for example, the back left seam). Holding this excess material tightly, look at the seam on the opposite side of the body (front left seam in this example). If the front seam is laying flat, that’s great! If it is standing away from the body, this area must also be marked as in step (3). Be sure that the pair of dotted lines taper out to a point at the top and bottom of the areas of excess material, so that the seams can come together again smoothly. Now check the sleeve length. The sleeves should stop at the wrist and not interfere with the wearer being able to bend his/her hand back. If the sleeves are too long, fold them up at the wrist and mark a line along the fold on the reverse side of the material. If there are zippers, close them to the fold, but leave them open below that. After marking the inside, let the folded edge flop back down and mark the crease on the outside of the suit. Be sure to do both arms. The suit should fit snugly next to the body. If the sleeve is loose, gather the excess material along the seam on the underside of the sleeve and mark it as in step (3). Be sure to do both arms, and check all the way up to the armpits. Do the same process as steps (8 and 9) down each leg. The suit may have a collar already attached. Confirm the height of the collar is comfortable. If it needs to be shorter, mark a line for trimming away excess height. Take a photo of the wetsuit on the person, capturing the areas that are the loosest, or fit poorly. Take a few notes and make a list of all the places where alterations are needed. Material cost depends on thickness. Your cost may be higher or lower than this. Quotes extended on examination of suit. If you want a quote before authorizing the alteration, please include a payment of $27 (our minimum charge). If you decide not to have the suit altered, that fee is non-refundable. If you decide to go ahead with the alteration, the $27 will be applied to your final invoice. Rush service is available for some alterations at an additional charge of $45 for 24-hr turn around or $30 for 48-hr turn around. Prices available upon request for items not listed — ask us! Please plan time for 1-2 consultation and fitting sessions, depending on the extent of the alterations. Terrapin charges a $60 cleaning fee for suits that are so dirty they would contaminate our sewing machines. We also reserve the right to refuse to work on suits that are just too nasty for words, so if you send a suit for alterations, please be sure it is clean and dry. Our minimum rate plus return shipping will be charged, even if work is refused or not possible.